No Rox BioRad iCycler MiniOpticon, Opticon 2, Chromo 4, iQ5; Roche LightCycler 480; MJ Research DNA Engine Opticon 2, Chromo 4; Corbett Rotogene 3000, 6000. Low Rox ABI® 7500 qPCR Systems, ViiA™ 7, QuantStudio™ 12K Flex, Agilent Mx3000P™ Mx3005P™ and Mx4000™. Regular Rox ABI® PRISM® 7000, 7700, 7900HT, ABI® 7300 qPCR Systems, GeneAmp® 5700, StepOne™, and the StepOnePlus™. Accurate quantification of NGS DNA libraries is critical to ensure efficient data generation and high quality reads. Quantitative Polymerase Chain Reaction (qPCR) is a highly sensitive and accurate approach for quantifying a NGS library and uses a minimal amount of material compared to other quantification methods. The qPCR quantification tracks library concentrations as a function of PCR cycle number in order to derive a quantitative estimate of the initial template concentration based on the known DNA concentration as control or standard. Thus, the control template should be as similar as possible to the libraries for quantification, in terms of template size, GC content and library type. It is also very important that a constant quantity of the control template is available, as for each round of library quantification determines the cluster generation efficiency, in turn to adjust the loading amount of constructed libraries for the sequencing, even slight variation of the standard leads to fluctuation of cluster density, either compromise the data quality or waste the sequencing capacity. 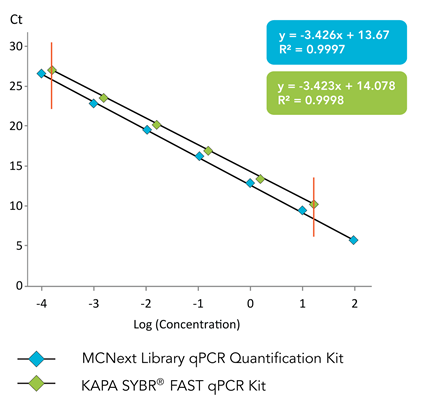 The MCNext™ SYBR® Fast qPCR Library Quantification Kit provides a fast and reliable solution to determine the library concentration with a direct estimate cluster density. This direct measurement method significantly saves time and resources comparing with other qPCR library quantification kits on the market. This is achieved by providing a constructed library rather than a single DNA fragment as a control standard with known cluster generation density on Illumina® sequencing platforms. 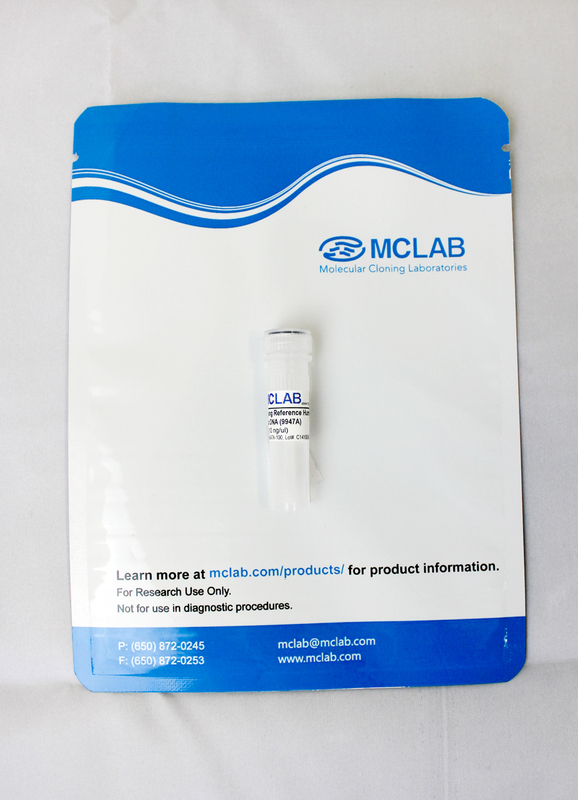 The MCNext™ SYBR® Fast qPCR Library Quantification Kit utilizes MCLAB’s high performance fast PCR enzyme by a Phi X genome based Library Standards (for seven 10-fold dilutions) with an average size of 570 bp, providing quick and accurate quantification with 0.0001 – 100 pM dynamic range in 60 min. Based on the quantification, the result could be directly converted to cluster numbers for loading volume references. The MCNext™ SYBR® Fast qPCR Library Quantification Kit is a rapid solution for your library construction QC to add value to your workflow and increase confidence in your results. The proprietary Phi X Library Standards consist of a group of Illumina® sequencing adapter-ligated DNA fragments derived from the Phi X genome with well-characterized sequence and well-balanced GC content (50%). To use this library as a control for libraries constructed for sequencing on Illumina® sequencing platforms is far superior than a single DNA fragment as control standard used by other qPCR quantification kits on the current market. It can be rapidly interpolated for the estimating cluster density and serves as a quantification baseline for sample libraries without the need to have another sequencing run for a cluster density measurement purpose. It is an excellent control with measured cluster generation conversion parameter to examine the library quality and quantity, allows you to quickly determine if an error is related to the sample preparation before a high-cost sequencing run. Quantification is fast, direct and accurate by extrapolation against the standard curve generated using the seven 10-fold Library Standards dilutions, followed by a simple cluster number conversion. The MCNext™ SYBR® Fast qPCR Library Quantification Kit is available in 3 types (Regular ROX, Low ROX and Universal) based on the internal reference dye preferences of the PCR thermocyclers. The packages include ready-to-use 2X Master Mix, 10X Primer Mix and Phi X Library Standards. 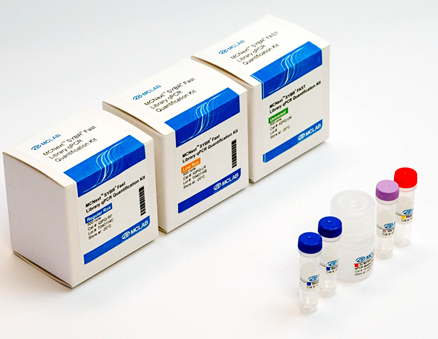 The MCNext™ SYBR® Fast qPCR Library Quantification Kit provides researchers with an accurate and sensitive method for quantifying NGS libraries. Figure 1. 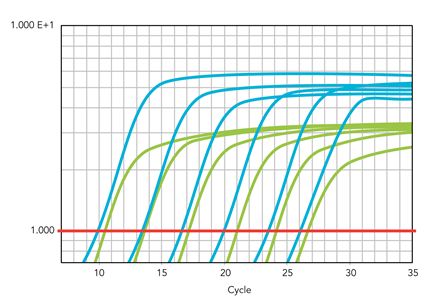 Comparison of amplification plot and standard curve of the Illumina PhiX library using MCNext SYBR Fast qPCR Kit (blue) versus KAPA Library Quantification Kit (green). A. Amplification plot of 10 x serial diluted PhiX library. B. 10-fold serial dilution of PhiX library standard curve. Higher fluorescence and 10x better sample quantification range in linear amplification plots confirm that MC kit achieves better efficiency and broader dynamic range. Figure 2. 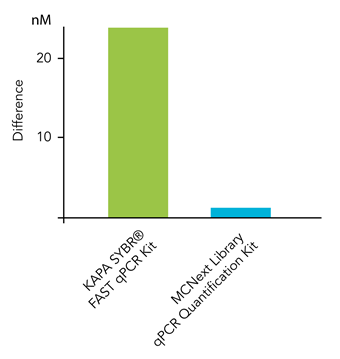 Comparison of library quantification consistency using MCNext SYBR Fast qPCR Kit (blue) versus KAPA Library Quantification Kit (green). A. Histograms represent quantification results subtracted by actual Illumina PhiX library concentration (10 nM). B. 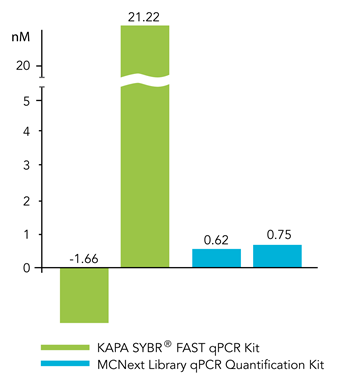 Standard deviation plot demonstrates superior consistency of MCNext SYBR Fast qPCR Kit (blue) to KAPA Library Quantification Kit (green). Figure 3. Analytical result of the Phi X Library Standards. 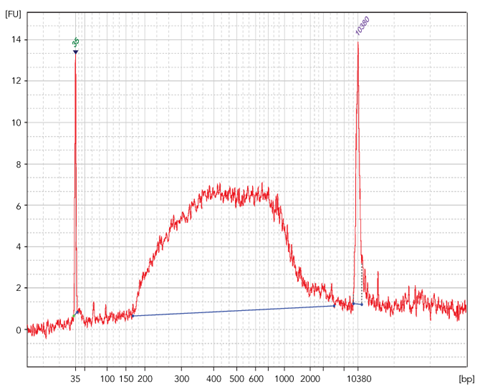 A. Electropherogram from Agilent 2100 Bioanalyzer indicates library average size of 500bp sized aligned with the fragmentation design. 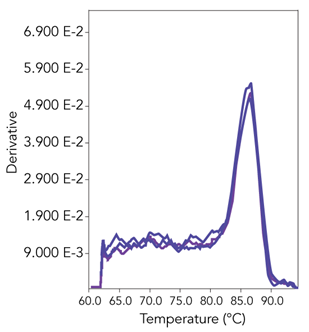 B. Melting curve shows a single peak without nonspecific amplification products.